The young players from Test Valley Brass Youth Band and the beginner band Frosty’s are a step closer to achieving their target of £10,000 for the purchase of some much needed new instruments. Last night saw the band put on a wonderful Christmas performance to a sell-out audience at the Lights Theatre in Andover. There were the usual delights to wow the crowds from band players young and old with some interesting new additions this year! Poor little Tiny Tim (alias Conrad) desperately wanted to play a Christmas carol to all but Chris the “Scrooge” Sharp just wouldn’t permit it! A visit from the ghosts of Christmas Past, Present and the Future (with some extraordinary acting skills, it has to be said!) were needed to help Chris the “Scrooge” Sharp change his ways so Tiny Tim could play his carol to a delighted audience! The Youth Band was also joined by a talented young singer, Lucy Bourne who sang a rendition of “The Fairytale of New York” whilst the Youth band accompanied her. During the evening, supporters of the band Dorothy & Brian Page presented a cheque to Peter Heslop, the Chair of Test Valley Brass, for the sum of £350 towards the purchase of new instruments for the Youth band and Fosty’s. They are both avid supporters of Test Valley Brass Band. Dorothy had recently completed a sponsored walk and very kindly donated half of the amount she raised to Test Valley Brass Youth Band. 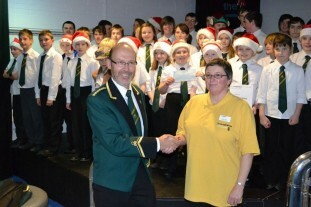 Test Valley Brass Youth Band has also received the local support of the Co-operative! They have recently been awarded the sum of £2,000 from the Community Fund Grant scheme, which supports local community, voluntary or self-help groups. Helen, a representative of the Co-operative Community Fund, attended the concert last night and presented a cheque for the sum of £2,000 for the Youth band towards the purchase of new instruments! This will be a huge boost for the bands fund raising target of £10,000 and the band are extremely grateful to everyone for their generosity! Test Valley Brass’s Christmas concert which included the whole family of bands, the Youth Band, Frosty’s the beginner band and the Senior Band was a huge success last night and offered the community of Andover the opportunity to go along, see and support a local group of people who put on a fantastic show for all ages!